Gorilla Warfare SALT 30mL - 50 BMG ReloadedPineapple Strawberrry Dragonfruit Pina Colada*NOT FOR SUB..
Gorilla Warfare 120mL - 50 BMG ReloadedPineapple Strawberrry Dragonfruit Pina ColadaAvailable in 0mg..
Gorilla Warfare 120mL - 5.56 ReloadedCactus Kiwi Gummy WormAvailable in 0mg, 3mg, and 6mg nicotine l..
Gorilla Warfare Salt 30mL - 5.56Available in 35mg and 50mg nicotine levels in 30mL bottles. *NOT FOR ..
Gorilla Warfare Salt 30mL - .45Available in 35mg and 50mg nicotine levels in 30mL bottles. *NOT FOR S..
Gorilla Warfare Salt 30mL - 50 BMGAvailable in 35mg and 50mg nicotine levels in 30mL bottles. *NOT FO..
Gorilla Warfare Salt 30mL - .308Available in 35mg and 50mg nicotine levels in 30mL bottles. *NOT FOR ..
Gorilla Warfare Salt 30mL - .270 Available in 35mg and 50mg nicotine levels in 30mL bottles.*NO.. 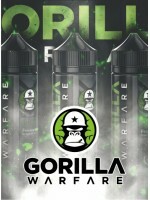 Gorilla Warfare 120mL - 50 BMGA heavy hitting pineapple and dragon fruit flavor.Available in 0mg, 3m..
Gorilla Warfare 120mL - .270 ReloadedA Frosted Flakey Pastry with a bit of strawberry jam.Available ..
Gorilla Warfare 120mL - .308Honeydew, Strawberry, and Pear blended to smooth perfection.Available in..
Gorilla Warfare 120mL - .270 A Frosted Flakey Pastry.Available in 0mg, 3mg, and 6mg nicotine le..
Gorilla Warfare 120mL - .45 Sour Blue Raspberry Peach Sweet Tea.Available in 0mg, 3mg, and 6mg ..
Gorilla Warfare 120mL - 5.56 Blue Sweet Agave Cactus.Available in 0mg, 3mg, and 6mg nicotine levels ..